The Coachman VIP range gets a unique heating system on the 2012 models as well as big, bold graphics. Both the VIP and the Pastiche ranges now have the Truma Combi-Boiler system, The first important point about this system is that the heater unit is hidden away under a settee, rather than presenting itself among the furniture. That aspect frees up space for an extra cabinet. The second feature is less obvious. This heating system is programmable – rather like the hot water based Alde system. The difference is that the Truma Combi-Boiler unit pushes warm air around the caravan, whereas the Alde system circulates warmth via hot water in radiators. The timer allows you to have two timed settings per day, controlled from a panel that’s very easy to understand. In the four-berth 520-4, the panel is above the small dresser that separates the lounge from the offside, two-seater dining area. 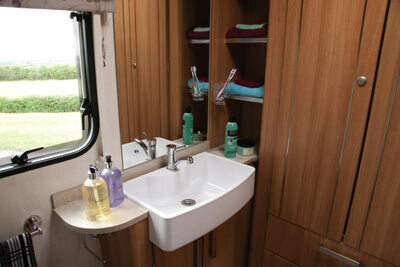 The Coachman’s shower runs across the whole rear of the caravan’s layout. The shower is circular – with a stunningly pretty lighting feature. To use the double bed in the lounge you pull the base out from one side, rather than pulling out central slats from a chest of drawers. The slats are mounted on a metal frame. Compared to the more commonly-found slat system, these metal-framed bed frames seem sturdier and stronger. There’s another advantage to the Coachman front bed system. The design allows you to have three drawers instead of two at the front, because space doesn’t have to be made here for a roll of slats. The 520-4’s layout, with its end shower room and side dining area, is a tried and trusted one that appeals to both couples and families. Couples like the convenience of a permanent dining area; families have the flexibility to create one single bed and a bunk above it if there are four aboard. 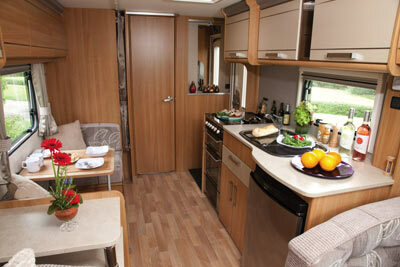 In caravans with this layout the dining area bed length is often shorter than adult height. But in the new VIP 520-4, the lower bunk is of adult proportions – just; it’s 1.8m. There’s an enormous wardrobe and lots of cupboard space in the washroom, and storage under four seating areas. You also have a cabinet in the dresser that divides the dining area from the lounge; overall, this model’s storage capability is capacious. 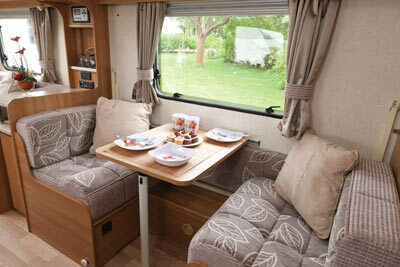 This caravan has just about as comfortable as a parallel lounge can get, with deep knee rolls on firm upholstery. All four arm rests are solidly supportive, with lovely deep curved shapes at the front corners. The full-width sunroof that lets so much light into the lounge has a design feature that adds to the refined look. Its surround is neutral-coloured, matt plastic that almost looks like fine suede. Lighting throughout the VIP is stunning – and is a particular feature of the lounging area. The 520’s kitchen is capable, in terms both of storage and work surface; although it’s not the biggest kitchen around, it is well-designed. 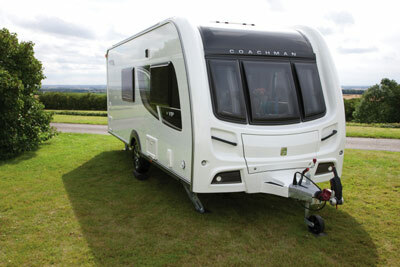 Coachman has built its reputation on solidity of construction. Furniture is precision-engineered, with rounded, edges. The roof is double laminated and, like those on Bailey caravans, is strong enough to stand on – not that we’d recommend you do that of course! 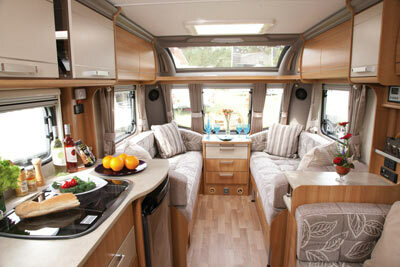 * Caravan insurance cost based on 2012 Coachman VIP 520-4 £21,595. Fitted with hitchlock, alarm (standard on this model), AL-KO ATC Electronic Snaking Device (fitted as standard), and approved Tracking Device and kept on drive behind post at HX4 0BE. Caravanners over 30 years old, claim free for 3 years and a member of a caravanning club. Quote includes 10% online discount and 6% Insurance Premium Tax and is correct as of 15.11.11. I bought one of these and took delivery just after new year. As I write I am sitting in the van at roslin CL site. A few points I have noted while the new truma heating system does a great job of heating the van it is painfully slow at heating the water you only get enough for a 5 min shower then have to wait 30 mins for it to heat up, it only heats the water to 60c, a real deal breaker I wish I knew before I bought it thinking of having a whale system fitted as use on a CL site you need hot water!. The locks on all lockers feel cheap and sticky in operation.on the plus side the grade three insulation is great no cold spots even in Scotland in February , the wash room is the crowing glory a lovely big sink you can use. And a wardrobe big enough for all the winter coats and shoes. It tows well and looks great. Shame about the water system . Looks a well finished van, in the Coachman tradition , but when are the designers going to design . This 4 berth layout is now standard in all makes of van and they don’t seem to be able to get away from this design. One more gripe I feel the washbasin is too close to the wardrobe which seems to overcrowd. the price of the 520-4 is in the small print on the page above, it’s £21,595. I’ve now added it to the main body copy though to make it more prominent. The 520-4 looks very nice but how much is it? seems to me you don’t want us to know.